A medium thickness Kettle Cooked Chip that featured a crispy crunch that was not so delicate, that the Chips shattered into thousands of pieces as soon as they were munched into. These Chips were of a nice thickness, but not so thick as to be soaked with hardened oil. There were oil bubbles but these were of an inconsistent size. The powdery residue made them feel scraggy edged. There were also a number of strange shaped Chips including a couple folded into four. We are sticklers for correct combo naming at Chips & Crisps. If a pair of flavors are mentioned on the packaging we expect to see that pair of flavors balance. Either by merging the two delicately or by bouncing from one flavor to the other. 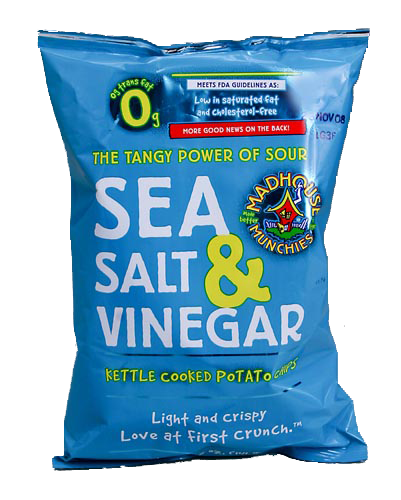 These, like so many tried before them, were overly heavy on the vinegar. The fact that they shout the AND on the bag provided them additional scrutiny. The flavor should have been called something along the lines of, 'Relatively mild, but with a decent enough tang Vinegar, with a hint of Salty Potato'. They were very nice though!